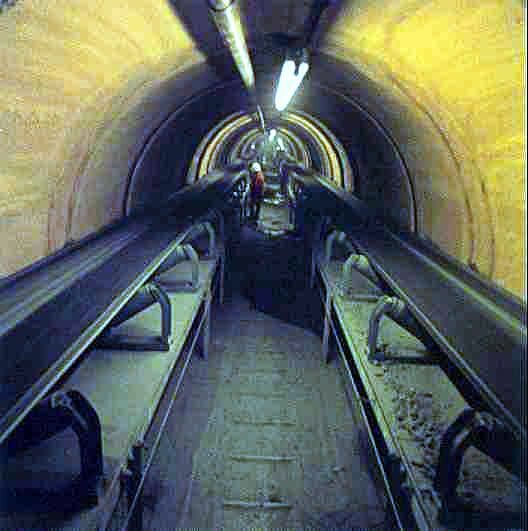 In September, 1964, tunnel driving began. The tunnel, through which ore travels from the mine at Leduc to the mill at Tide Lake, passed under three glaciers and three mountain ranges up to 7,000 feet high. Because this tunnel would be the life line of Granduc, it had to be designed for fast, large-scale, safe transportation of people, ore and supplies. Fifteen feet in diameter and carrying a high-speed railroad system, the tunnel was to be driven by two crews working from each end, planning to meet at the midpoint. At the end of the shift, miners return to the terminal at Tide Lake, where they wash and change clothes.And so they would have, had not Nature stepped in. The Tide Lake heading at the planned site of the concentrator was no great problem insofar as supplying men and materials was concerned. However, at the mine end, at the Leduc Glacier, the tunnel crews faced real hardships. To reach the Leduc camp where the crews lived that first winter, one drove nine miles from Stewart to Cantu at the foot of the Salmon Glacier, then boarded tractor-drawn sled trains for a 22-mile run up the glacier and over a 5,500-foot ice-filled pass to Leduc. By February, 1965, the men at Leduc had driven just 28 feet of tunnel. That month, an avalanche roared down on Leduc, killing 26 crew members and wrecking much of the camp at the tunnel portal. Although a thorough Government investigation cleared Granduc Mines of any negligence or safety violation, the company halted work at Leduc, and brought in a renowned avalanche expert to advise the company on measures to avoid future avalanche damage. His recommendations were scrupulously followed. At about the same time as the avalanche, detailed engineering work had begun to indicate that the Granduc project would be considerably more expensive than originally estimated. Furthermore, driving the tunnel from one end, which now seemed necessary, greatly increased the expense, as did the avalanche control measures instituted. In short, Granduc, in 1965, faced severe financial, as well as technical, problems.